Hyperlincs Limited is a small family run business based in Sleaford. Providing professional affordable Web Sites and PC support services is our aim. Providing costs up front where possible and to provide excellent service is our policy. Our customers are treated as we wish to be treated ourselves at all times. 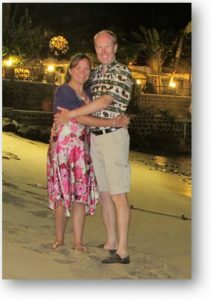 Husband and wife team Ian and Louise Freeman founded the company in October 2016. Prior to running Hyperlincs, Ian worked within the IT industry for over 20 years. Ian had various roles that encompassed website design and PC support. Ian also headed up a consultancy department for a multi-national company that designs and builds custom supercomputers. In September 2016 Louise had a life changing accident, breaking her neck, resulting in substantial paralysis. Due to this accident, as a couple we decided to make some significant changes. We set up Hyperlincs so that we could work together from home, supporting each other and our family. The Hyperlincs logo took its inspiration from Louise's accident, as the company would not have existed had the accident had not occurred. The circles within the logo represent the different vertebrae of the human spine, with the largest circle representing the brain. The different colours relate the the different sections of the spine. These are from right to left: cervical; thoracic; lumbar. The cervical spine is broken between C6 and C7, this is where Louise's neck is broken. Finally, there is a section missing from C7 (as seen below the "i" in Hyperlincs), this was broken off, during Louise's fall.